Identification: This broad, flattened aeolid is midnight blue on the ventral surface (facing upward in the photo) and silvery blue on the dorsal surface. Its cerata extend laterally from three distinct pairs of lobes. In contrast to Glaucus marginatus, the cerata are arranged in a single, flat row along the edge of each lobe. 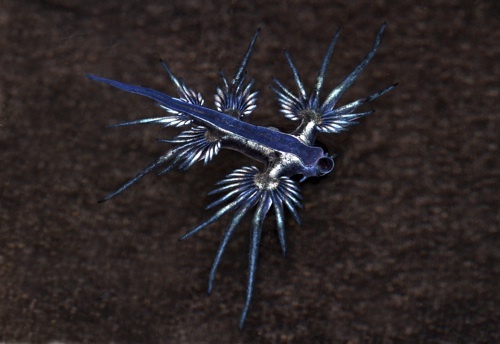 Natural history: Glaucus atlanticus is rarely seen except during periods of on-shore winds which bring them (and their prey) into coastal waters. Then, they can be found in numbers floating on the surface and, sometimes, even washed up on beaches. They are holoplanktonic, spending their entire lives drifting with the foot oriented toward the surface. They float partially by means of an air bubble that they have swallowed and stored in their gastric cavity and are able to move toward prey or mates by using their cerata to make slow swimming movements. They eat a variety of drifting prey including the siphonophore Physalia utriculus (Portuguese man-o-war) as well as the chondrophores Velella velella and Porpita pacifica (see photo). Occasionally, they will also eat each other. Like many other aeolids, they store the nematocysts from their prey in the tips of their cerata for protection against predators. Unlike in most aeolids, the sting can be felt by humans. The dark ventral coloration (which faces the sky) may help in concealing them from birds while the light dorsal coloration (facing down) may help in concealing them from fish. However, some pelagic fish do feed on them. (Note 1) Their egg mass is a straight thread of white eggs up to 17.5 mm long that floats freely in the water (Ross and Quetin, 1990). These authors also reported that freshly collected individuals produced 4-6 egg strings per hour with 36-96 eggs per string and a total of 3300-8900 eggs per day. Distribution: Big Island, Maui, Oahu and and Kauai: cosmopolitan. Taxonomic notes: The genus name means "bluish gray" and the species name refers to the ocean from which it was first named. It is referred to as the "man-of-war nudibranch" in Hoover, 1998 & 2006. It was first reported from Hawaii in Bergh, 1860 (as Glaucus longicirrus) and was listed under that name in Edmondson, 1946. Photo: PF: washed up on Keawakapu Beach, Maui; Nov. 25, 2010. Note 1: We have observed a pelagic triggerfish (Canthidermis maculatus) regurgitate a Glaucus upon being caught.